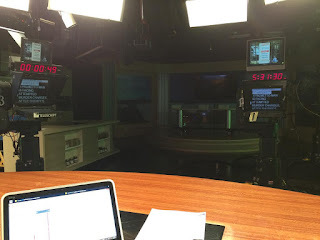 Whenever I'm asked to give talks to organizations about my job, I usually do a "Top 10 Things You Didn't Know about Working in Television News" because I find most people are curious and confused about we actually do all day. (Hint: It's not show up 30 minutes before the show and get our make up done.) One of the things I share during that talk is what a typical day looks like and how the workflow differs for each job position within a newsroom. 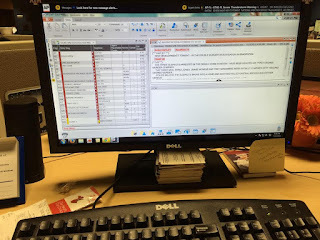 Earlier this summer, I chronicled one work day. This day was a little different, because I filled in on our Suncoast View talk show. But it's not unusual at all for me to have some work-related responsibilities before my scheduled shift starts at 3 p.m., whether it be promo shoots, interview shoots for an upcoming story, emceeing a luncheon, or as mentioned above, speaking to community groups and organizations. I hope this gives you some insight into the "glamorous" job of a broadcast journalist. This show is unsual (read: lucky) in that a very generous hairstylist has volunteered to come in to do the ladies' hair. 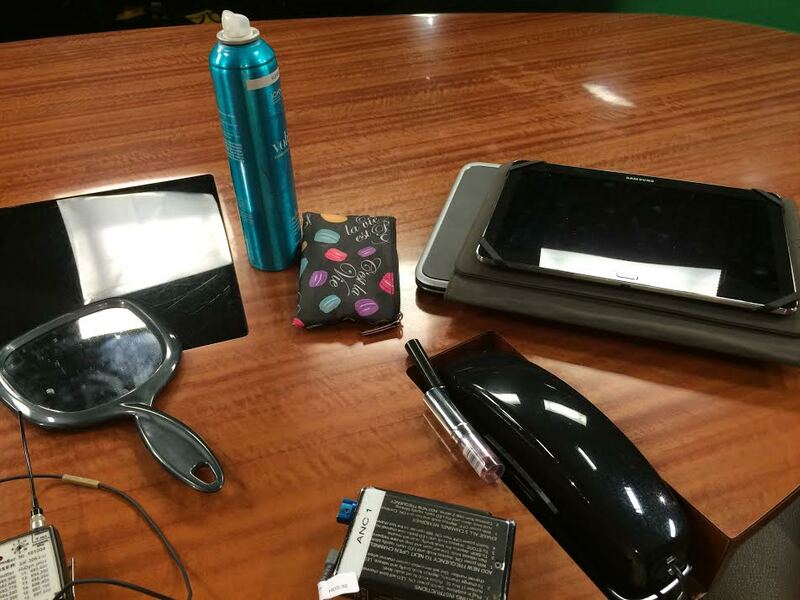 This unfortunately doesn't happen on any other ABC 7 show; we do our own hair. 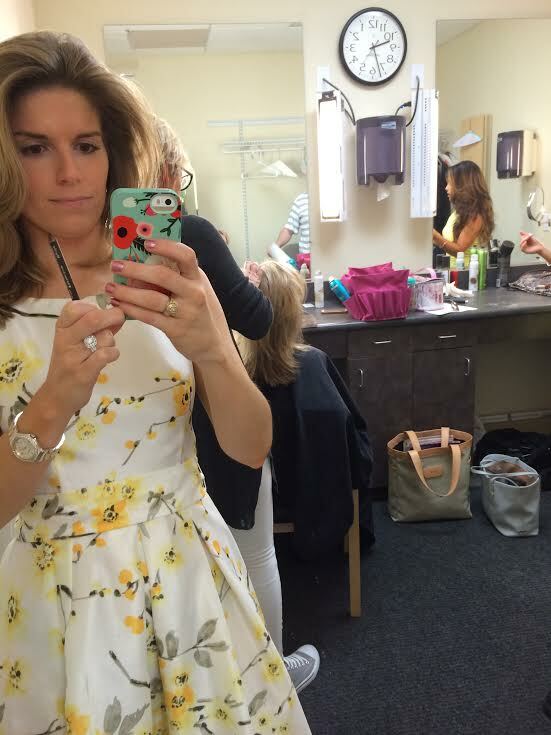 But when I sit in on Suncoast View and there's time, I get my hair done! It's the best treat possible. And no, we don't have make up people either. While the newscasts I anchor at 5, 6 and 11 p.m. are live, this show is taped at 10 a.m. and airs at 4 p.m. It's live-to-tape, which means they don't stop and re-do segments. On the days I co-host this show, I don't get much sleep because I get done with work after midnight the night before. But it's worth it; it is a lot of fun! There are perks to this job! This ice cream was amazing. I got to try the salted caramel and it tasted like butter! It was absolutely delicious. 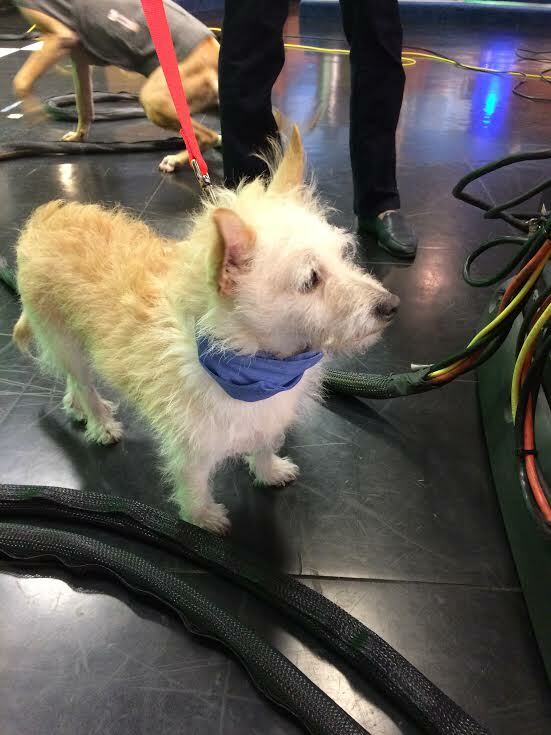 Any day I get to be on-air with pups is a good day! I wanted to steal this one. 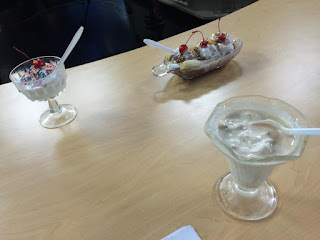 In television news, we cover just about everything...which is why within the course of an hour we did went from ice cream, to dogs, to legal issues in the workplace. 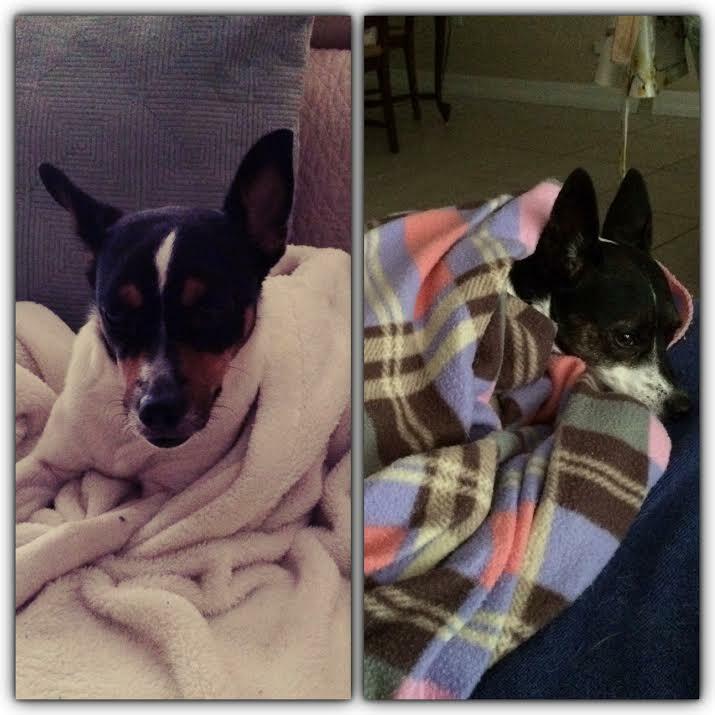 After Suncoast View was done taping, I decided to get a head start on a few things because I knew the afternoon would be busy. 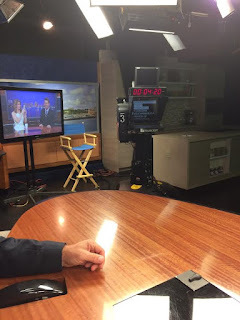 Usually my co-anchor, Scott Dennis, and I split up pre-show updates, (one day I do radio, he does TV, and vice versa) but he was on vacation, so I had to do all of them that day. 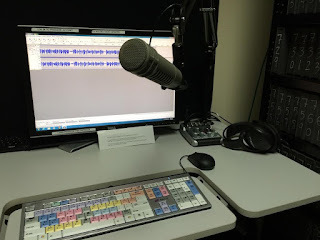 Each day, one of us writes a one-minute spot that previews what is coming up in our 5 p.m. newscast, record it and send to a local radio station. This must be in by 3:30 p.m., but I sent it early this day to free up more time later. I was able to head home for a little bit to take a rest with these sleepy snugglers! After getting back to work and touching up my makeup (remember, no make up people), it's time to tape TV "updates" that will air throughout the afternoon to promote what's coming up in our 5 p.m. newscast. At this point in the day, I get to my desk in the newsroom and read the scripts for the newscasts. I try to catch errors and make revisions to make the scripts written by the producers and reporters. We do a short, live news and weather cut-in while Suncoast View is airing (the show I taped earlier). This photo shows Bob Harrigan at the weather wall. This is another one of those things Scott and I would have split up had he not been vacation, but when we solo anchor, we do both cut-ins. Pictured is my IFB, which stands for interruptible feedback or foldback. 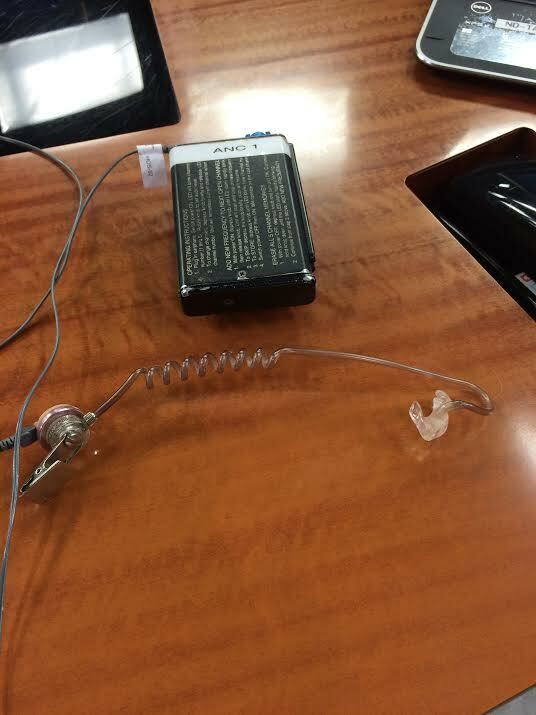 It's the earpiece we wear when on air so that we can hear programming, as well as the producer, director and audio operator when they need to talk to us from the control room, or booth. The weirdly-shaped thing on the right is the earpiece that was custom-molded to fit my ear. I clip this on to the back of my collar and hide the curly-cue wire behind my hair. The black box is the power source. 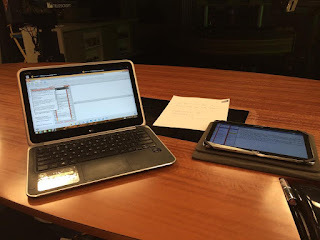 We aren't able to edit the scripts in the program on the tablet, so we still need a laptop. 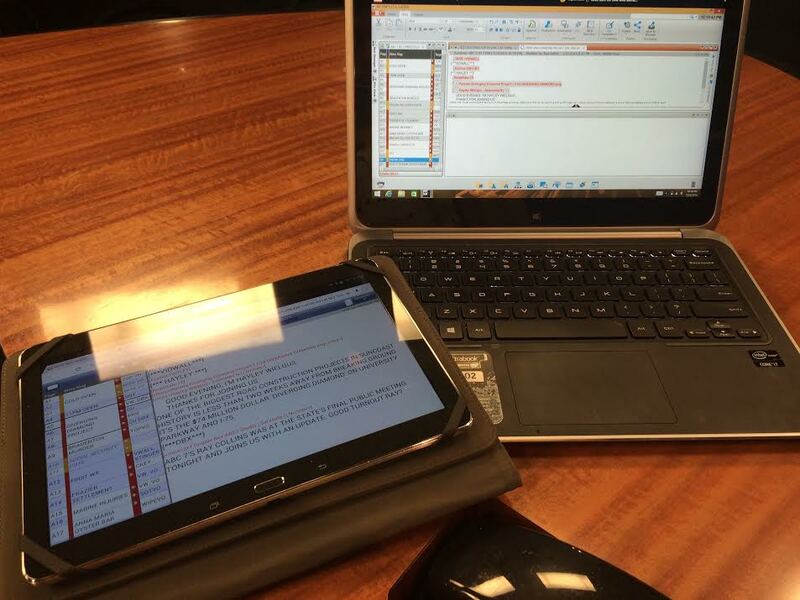 Some scripts will come in late, so we'll read through those while on the desk throughout the newscast. Newscasts are done in blocks separated by commercial breaks, starting with, obviously, the A Block. This is my view from the anchor desk. 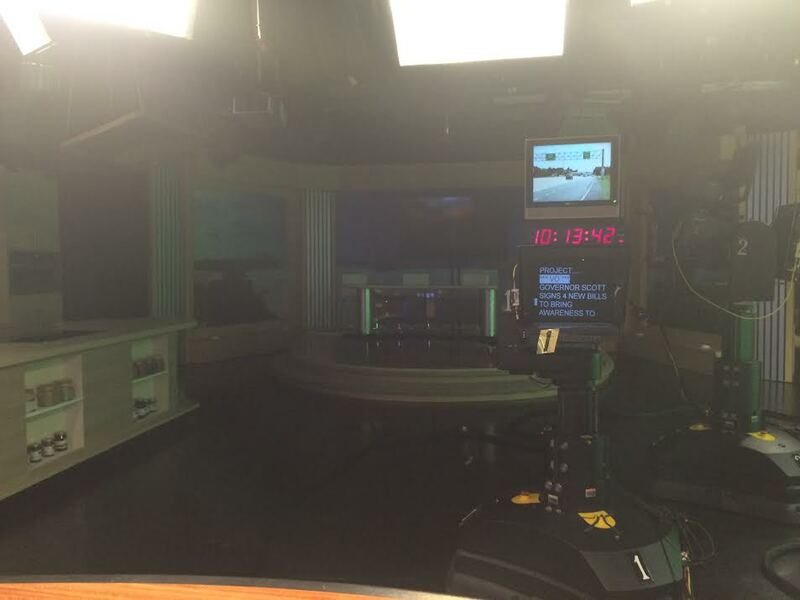 Straight ahead is the Suncoast View and ABC 7 News at 7 set. 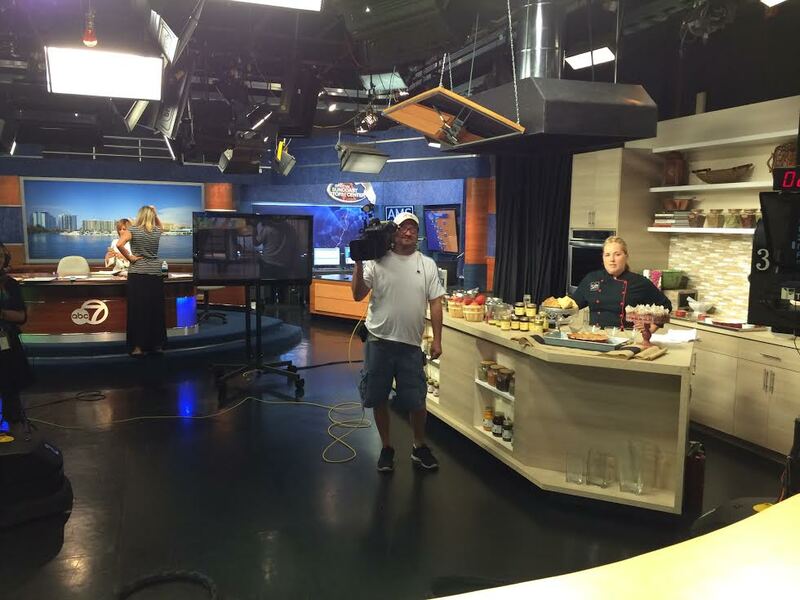 On the left is the kitchen used for on-air cooking segments. After the 6 p.m. show is over, I tape updates that will promote the 11 p.m. newscast during ABC prime time programming. This is a photo from under the anchor desk of the foot pedal we use to run the teleprompter. 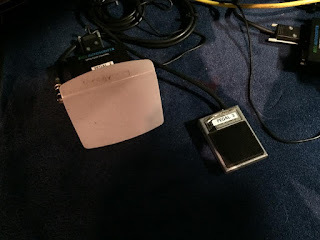 The left pedal is what advances the prompter, and much like the gas pedal in your car, the harder you press it, the faster the script goes. So you have to be careful! The square on the right is the button used to reverse the prompter if we need to go back. After these updates are done, I usually take a dinner break, and on occasion, I have events to attend. If I have a special report coming up, I'll usually do some work on that in between the 6 and 11 p.m. shows. Finish taping updates for the 11 p.m.
At about 10 p.m. we tape updates to again promote what's coming up in the 11 p.m. show. These will air during the 10 p.m. show on ABC prime time. Finally, the last duty of the day! 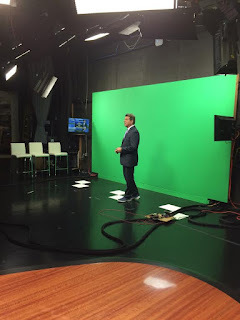 I always solo anchor this newscast and Bob does weather. It's only 30 minutes long, so it goes by quickly. I took a picture of me and Bob in the monitor. There are several monitors around the studio, so we can see if we're on camera or what video is airing. After the show is over, I usually catch up on emails, tie up loose ends and then head home a little after midnight. As you can probably tell, television news is not your normal 9-5 job! Since I started in news about 7 years ago, I've worked just about every shift there is --- mornings, nights, weekends, holidays...and sometimes all of the above in one week! 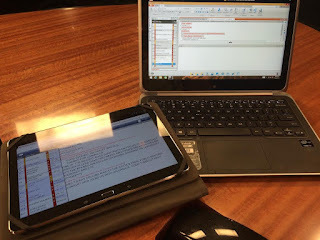 When I was primarily a reporter, the workflow of my day looked completely different. It involved setting up interviews, going out on multiple shoots, writing a script and reporting that story in the studio or out on a live shot. While reporting can be extremely stressful and less predictable than anchoring, it's a an exciting job that involves becoming a mini-expert on a different topic every day and always meeting new people. I still feel like a reporter at heart, so I try to get out in the field to work on stories as much as possible. I'm a health reporter at ABC 7, so I focus mostly on medical stories. While journalism does come with the drawbacks of any 24-7 business (sometimes working Christmas and having no social life ;), it does bring about opportunities and experiences I would never have otherwise. I cannot even begin to tell you the stories of the crazy things I've been through, good and bad! Many of us who work in TV daydream about more lucrative careers with better hours and less aggravation, but at the same time, we can't picture ourselves doing anything else.